When it comes to your own personal safety, you need to choose an ammunition that is guaranteed to give you the protection you need. This ammo from Federal will do just that. These 380 Auto rounds from Federal are a member of their Premium Personal Defense line of products. 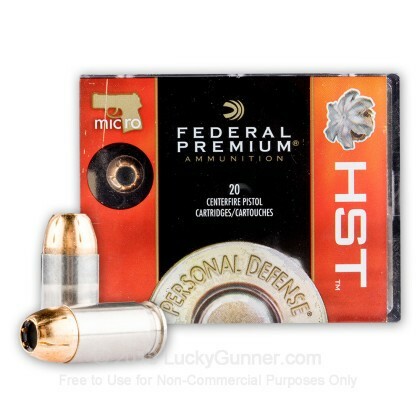 They contain Federal's very own 99 grain HST JHP bullet, sure to provide you the defensive stopping power you need. 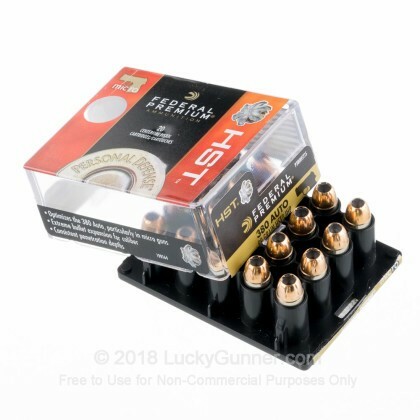 HST bullets are a top choice among law professionals worldwide due to their outstanding properties in self defense situations. They have nearly 100% weight retention through most barriers, excellent penetration, and massive expansion in soft tissue. 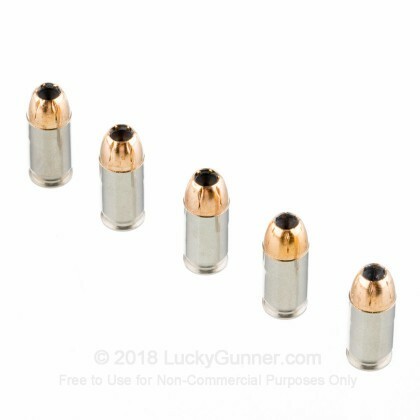 These rounds are Boxer-primed and brass cased. They are also non-corrosive and reloadable. Federal Premium ammunition is at the top of the list for all types shooting needs. Whether it's personal defense, hunting, sport shooting, law enforcement, or military, Federal's got you covered. You cannot compromise on quality when it comes to personal defense. Fortunately, Federal makes a product that is high quality and economical. Order your rounds and be prepared. After firing five rounds of Federal 99 gr HST from a Glock 42 into synthetic ballistic gelatin from 10 feet away through four layers of fabric to simulate clothing, we then measured the expansion and penetration of the bullets for this .380 Auto (ACP) load, which you can see in the chart below. The photos below provide a detailed view of the the expanded bullets that were recovered from the gelatin. The high-speed video shows the first of our five shots as it entered the gel. Finally, if you'd like to see how this Federal load compares to other .380 Auto (ACP) loads, check out the diagrams at the bottom of the page. Want to know more about our ballistic gelatin testing and self-defense ammo? Check out Lucky Gunner Labs for more information. 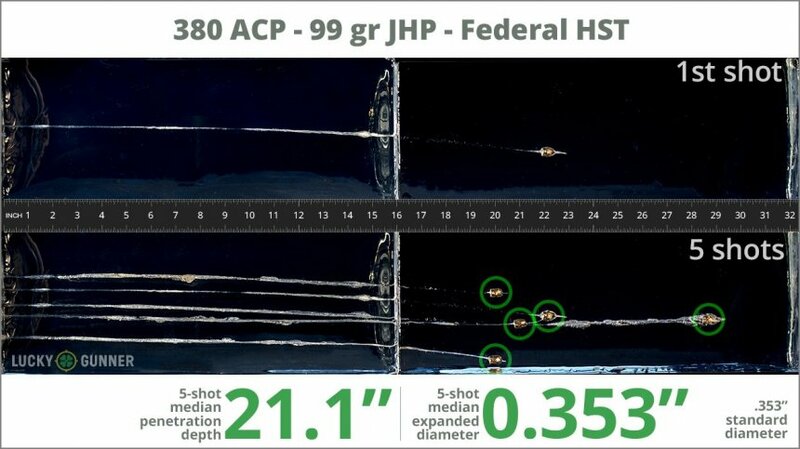 How do the results for this Federal .380 Auto (ACP) compare to other 380 Ammo? 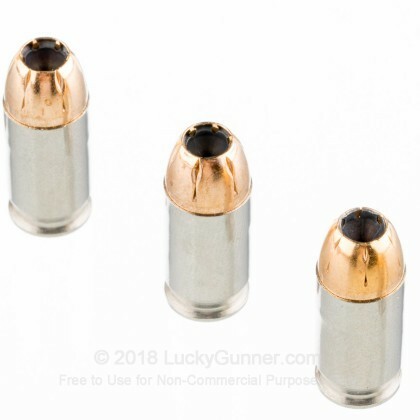 0.78" This ammo: 0.354" Min: 0.35" Median: 0.355" Max: 0.78"
21.1" 0" 6.5" 13.3" 28.7" This ammo: 21.1" Min: 6.5" Median: 13.3" Max: 28.7"
If you want penetration it's a good round at a real good price. Lucky gunner rocks. 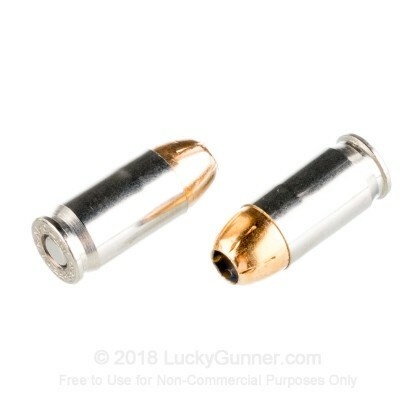 Sure it goes BANG when you pull the trigger, so the quality of the bullet itself is primo. But, its performance is horribly poor because it performs like regular ball ammo. It does NOT expand at all in real life situations. My agency unfortunately mandates this round in our .380’s as an optional off duty/back-up gun. This bullet is a total let down, compared to some other ,380’s that perform marginally better. So for a “beach” gun carried in the shorts, this HST round is only slightly better than throwing sand and sea shells at a bad guy. If you can run away instead, by all means do so. I suggest you use a better performing round like the Sig v-crown .380. Q: Thanks so much for all of your work in this testing. I am wondering if the .380 Federal HST that you tested was the "micro" variant. Thanks! 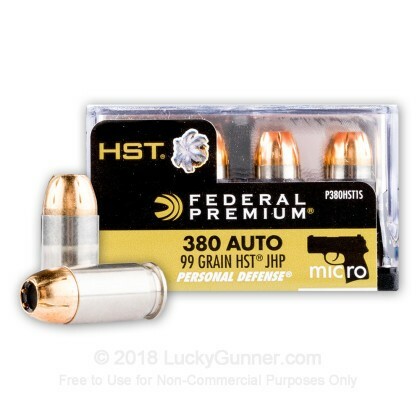 A: Hello Josh, The Federal HST .380 that was tested is the 99 grain "micro" product offering from Federal.